Dr. Mendoza hopes that his project will be just the beginning of a lifelong pursuit of academic radiology for many residents. The Adopt-a-Resident Committee is pleased to announce that Dr. Dexter Mendoza, R1, was recently awarded a grant to pursue his project for the Adopt-a-Resident program. The project is a 2- to 3-year longitudinal program with the goal of preparing radiology residents as they become educators of the future. As part of the program, Dr. Mendoza will recruit experts in education, both in and out of the Emory University system, to provide seminars and facilitate group discussions in education-centered topics including learning theories, learning and teaching styles, providing feedback, developing curricula, mentorship, and research. After providing the participants a foundation, they will be given a chance to put theory into practice by working directly with medical students and more junior residents. Each participant will also be paired with a mentor to complete a capstone project, such as a lecture series, an online learning module, or an education-centered research project. Dr. Mendoza has always been interested in medical education. 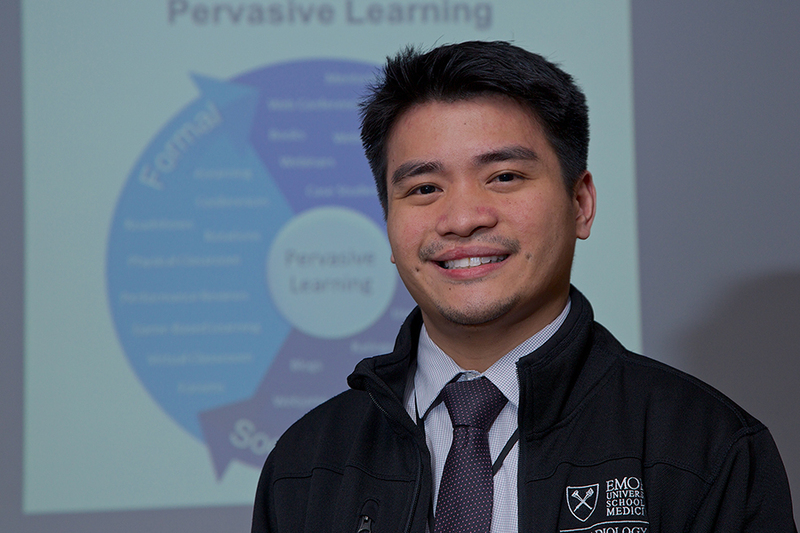 As to what inspired him to develop the program, he says, “I've always enjoyed teaching, and I think a lot of our current radiology residents are passionate about teaching too. It would be very beneficial for us to be able to acquire these skills early on in our training and be able to hone them to become more effective educators in the future.” With Emory Radiology being one of the top radiology programs in the nation, the residency program graduates are not only looked upon as trusted radiologists, but also as innovative researchers and inspiring educators. Dr. Mendoza hopes that his project will be just the beginning of a lifelong pursuit of academic radiology for many residents. He also sees the program growing in the future, and eventually expanding it to include residents from other specialties.